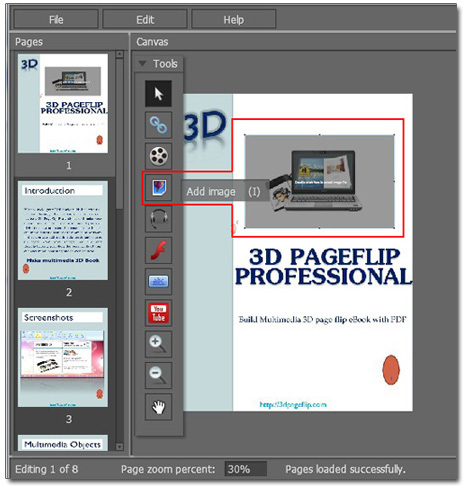 ﻿ How to design 3D eBook pop-up text for an inserted image? Q:How to design 3D eBook pop-up text for an inserted image? When you are using 3D PageFlip Professional to make page turning photo album, you will display large quantity of photos in to each page of the 3D page flip book. In addition, you would like to describe the images with some sentences. How can you do? Maybe you can draw some words beside the images. However, it will make the whole page become complicated if you do so. Now I would like to introduce a new way – pop-up text for images. When someone click image, the text will pop up. Otherwise, it will be hidden. Step1: Click “Edit Pages” to enter “Flip Page Editor” interface. 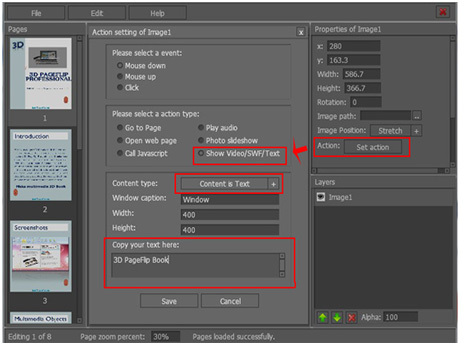 Then select “Add Image” to draw a frame for inserting an image to 3D page flip book. Step2: Then click “Set action” and select “Show Video/SWF/Text” and choose “Content is Text” in “Content type” pulled-down menu. Then input your text in “Copy your text here”. Step3: Save and exit. When someone clicks the image, the text will pop-up in a flash window at once.